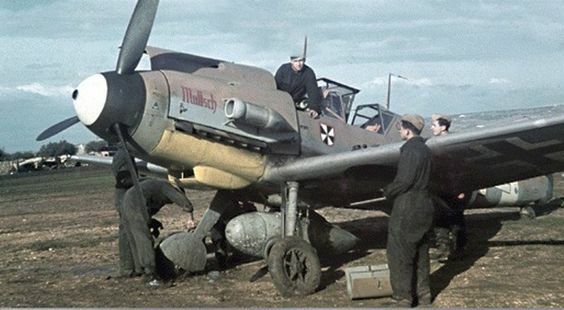 FalkeEins - the Luftwaffe blog: Shot down by German flak ! 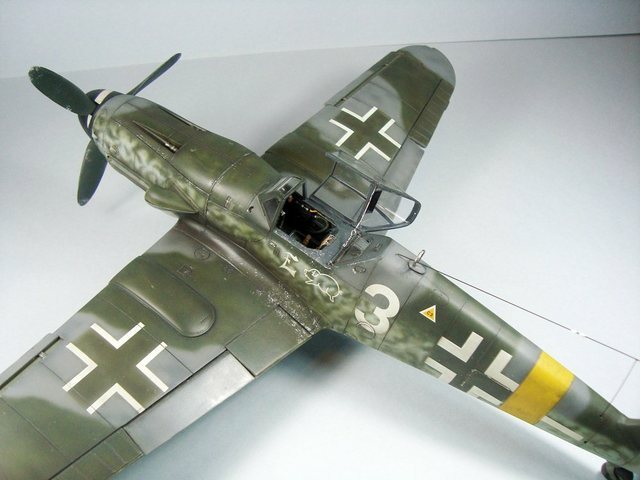 01 March 1945 Heinz 'Esau' Ewald II./JG 52 - "Wo wir sind ist immer oben"
Shot down by German flak ! 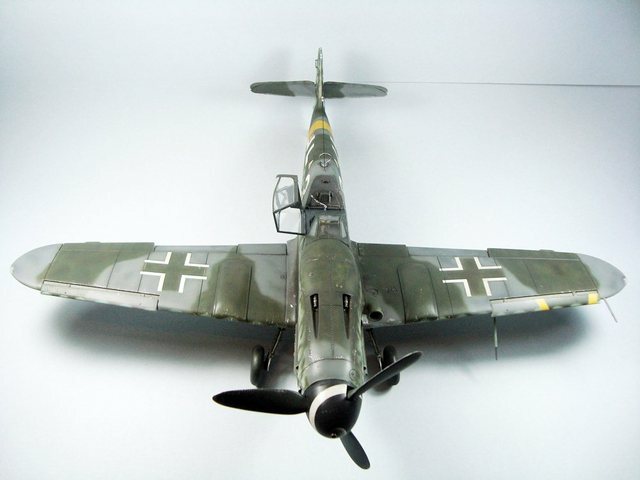 01 March 1945 Heinz 'Esau' Ewald II./JG 52 - "Wo wir sind ist immer oben"
..super Bf 109 G-10 built by Paulo (RATM) Neves. 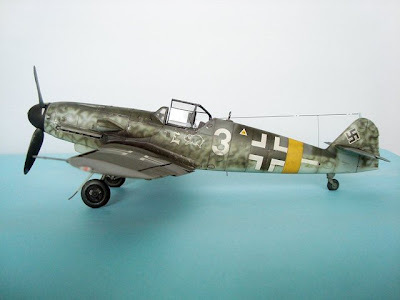 This is Hasegawa´s 1/32 Bf109 G-10 built mostly out-of-the-box with the exception of G-FACTOR landing gear, Quickboost central cannon and REVI 16 gunsight, evergreen, copper wire and streched sprue finished in the markings Lt. Heinz 'Esau' Ewald's 'white 3'. To accompany Paulo's build, a small translated extract from Ewald's out-of-print memoir "Wo wir sind ist immer oben " - I'm not sure whether this was a self-published volume or whether it was produced by the Traditionsgemeinschaft JG 52 (Falk Klinnert) but if anyone has a spare copy I'd love to hear from them ! Thanks to David Williams for the text extract ! Shot down by German flak - 01 March 1945 ! Veszprem - Alarm ! scramble !- Eduard 'Edi' Pitzl, Gerd Hauter, Anton Kellmeier and myself, Heinz Ewald, get airborne. Over Stulhweissenburg we come under fire from Russian and then German anti-aircraft artillery. Something's up! "Achtung", I call over the radio " viele Indianer vor uns ! Frage Victor? " - " lots of bandits up ahead of us, do you copy?" For heaven's sake Esau, I think to myself, there's at least twenty silver birds, dark American stars on the wings and fuselage, right in our path. "Esau to Edi, take your wingman and climb for altitude and don't attack until you have height advantage - we'll split up now, copy. I get a 'Roger' back - Roger! Esau, I say to myself, no doubt some of these 'Boys' (sic) will try and get in behind us and " reise- resise machen ". My wingman Paul Slodczyk was already covering me and we now climbed in a north-westerly direction in order to get into a position to dive down on the Amis. While we were straining for height I called up 'Jumbo' our controller and reported contact with a large group of Americans in the hope that they might be able to launch another Schwarm but we were out of luck - it was just the four of us against more than twenty of them...combat against superior numbers had become our daily bread and so it would be today. The Amis were now over Lake Balaton at around 3,000 metres. They were getting closer to our field. They were visibly not too concerned about us, which I was glad about. I had cut off their retreat and was now about 2,000 metres higher up and almost directly over the top of them. At the same time as I called out " Pauke, Pauke" I threw my kite over onto its wingtip and dove down into the attack! Almost simultaneously Edi Pitzl dove down and opened up on the Mustang flying on the left flank of their formation - a hit; the silver bird spun away out of control streaming smoke and a chute billowed out. I confirmed his victory and congratulated him just as 'my' 'Sibervogel' loomed large in my sight! Closing rapidly from astern I opened up - my first salvo streaked wide as the Mustang pilot threw his stick forward just as I squeezed the firing button! My wingman also over-shot. Couldn't be helped! My "Me" (sic) was now half-way over on its back pulling hard into a tight curve. This was no firing position but I was managing to stay on my opponent's tail. Suddenly a volley of tracers split the air ahead of us - another mad Ami was letting go with all he'd got right into our circle. It turned out that this Texas 'cowboy' - who no doubt practised his sharp shooting on whiskey glasses in the saloon bar - must have scored some hits as a short while later my engine started to cough and misfire. 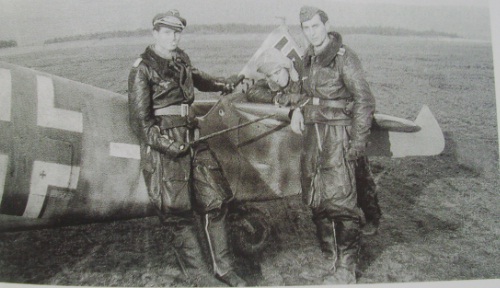 Meanwhile the Mustang pilot was pulling a tighter and tighter turn still with two Messerschmitt 'boys' on his tail, juddering on the edge of the stall and streaming contrails from their wingtips. I gave him another salvo and then another and saw a couple of lightning flashes on his machine. Then suddenly he pulled up and in a fraction of a second I pulled back hard on the stick, my Me shuddered, and I got off two more short bursts. The Mustang's controls had been damaged - he went into a gentle turn and now all my rounds were walking into his fuselage and wings. As I broke off- almost ramming my wingman - there was an explosion in the Mustang's engine, pieces of cowling and metal skinning whirled off into the slipstream and he streamed a trail of thick dark smoke. "Esau - Abschuss!" But now the other Americans were circling at a watchful distance - like laughing hyenas. Up to now - apart from the Texas shooter - they had - thank God - not got involved in the fight......"
Three P-51s chased Ewald's G-10/U4 (WNr. 610964) as far as Veszprem. At the controls of his lame and smoking "Me" Ewald's thoughts turned to comrade and 99-victory RK-holder Ltn Fönnekold who had been finished off by P-51s as he had tried to carry out an emergency landing in Hungary. He let down to low altitude hoping that the P-51s would be scared off by the flak - his manoeuvre resulted in his Messerschmitt coming under fire from the airfield defences! With his aircraft taking hits and suddenly feeling nose-heavy Ewald had just enough altitude to bail out over the side of the cockpit, immediately tugging on the ripcord. Even in his chute he came under fire - German troops disembarking from a train in the vicinity of the airfield opening up on what they thought was a Russian pilot swinging under his chute, as he was later told by eye witnesses. He came down some four kilometres from the airfield in a hard landing. Even spread-eagled on the ground, Ewald's ordeal was not over - he was approached by Hungarian workers shouting " Ruski kaputt !" " Man Esau - die wollen dich umbringen !" I drew my service revolver and started firing wildly over their heads..." As his comrade Sachsenberg put it; " you poor little sod Esau - first shot down by your own flak, then shot at by German troops, even our Hungarian allies were looking to knock your block off with their pickaxes!.." During this combat Uffz. 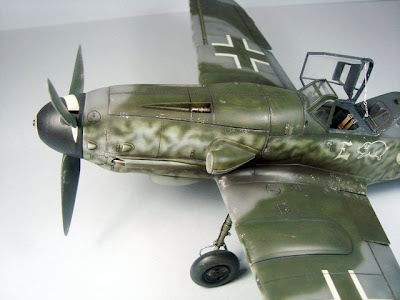 Paul Slodzyk's Bf 109 G-14/U4 (WNr. 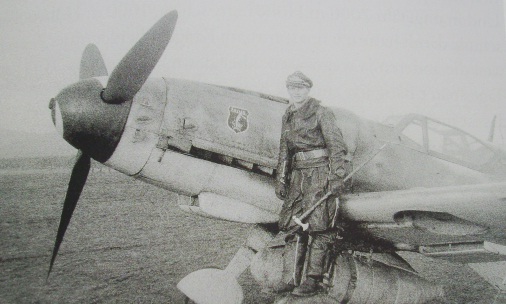 512613) was shot down in flames south-west of Veszprem while Fj Uffz. Helmut Rudzinski managed to force land his G-6 (WNr. 442047) at Plattensee. Fw Eduard Pitzl successfully bailed out of his G-10 (WNr. 610955) over Lovas.